Want to see what we have in our collection? Searching our catalog is the best way to see what we own on a certain topic, or a specific title. This short video will give you a quick overview of other catalog features. One *super important* feature of our library is our subscription databases. Brooklyn Tech pays thousands of dollars each year so you can access these database articles, videos and primary source documents...so the quality is much more reliable than what you can find in a straight Google search. You will use these databases throughout high school and all throughout college, so take a minute to watch our video about accessing them! VISIT the library to get the sheet with our password information! There are many free and wonderful primary source document collections online. This video demonstrates how to use the Library of Congress website, as well as the National Archives. Primary Source Document Online Resources from Joanna Drusin on Vimeo. This video demonstrates how to find appropriate databases in each of the NYC Public Library systems. Public Library Database Resources from Joanna Drusin on Vimeo. We have compiled a list of literary criticism resources available in our library, through the public library systems, through our databases and online. Please let us know if you need help locating one of these resources. This video will help you think of useful search terms by considering academic language, phrases, synonyms, and more broad or specific terms. Generating Great Search Terms from Joanna Drusin on Vimeo. This video demonstrates techniques to generate effective search terms BEFORE starting to conduct research on a scholarly database. This short YouTube video will help you differentiate between scholarly and popular periodicals, which can be tricky to do when navigating online resources. Be sure to check with your teacher to learn which types of sources you need to use for your research. The CRAAP test is one tool you might use to evaluate your source. 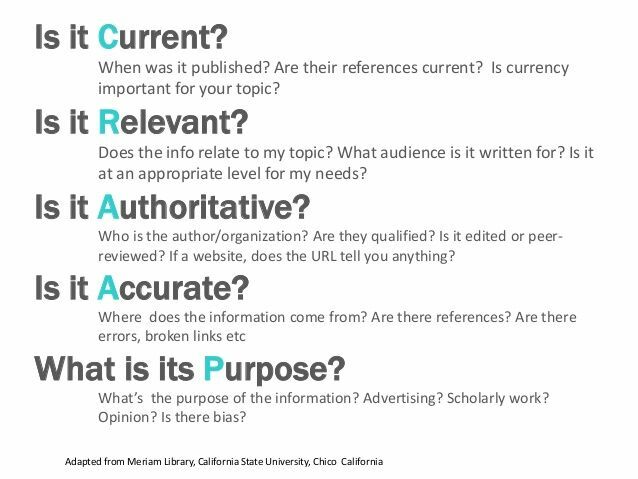 Also from California State University at Northridge, here is a worksheet that you can use to evaluate sources using the CRAAP guidelines. ** We loved using this website tool from the Cofrin Library at the University of Wisconsin, Green Bay. It guides you through the stages of evaluating your source and helps you decide if your source is reliable. Boolean Operator Machine allows you to visually understand the function of the different tools. The Colorado State University offers visual Venn diagrams to demonstrate more complex use of Boolean operators. This tutorial from CSU, is a helpful way to explore Boolean Operators more deeply. This short video, from the University of Toronto, demonstrates the use of AND in a search. This short video, (University of Toronto) demonstrates the use of OR in a search. This short video, from the University of Toronto, demonstrates a phrase search, which uses quotation marks to connect search terms you intend to keep together. The Gale databases offer a new tool which allows you to explore topics, subtopics and related topics. It also gives you a sense of which terms appear most frequently. Below is a video about how to use this tool.